Most brewers are passionate about the products they produce, and they understand that achieving and maintaining high quality is critical to their ongoing success. Many strive to get the finest raw materials, to understand their equipment and its limitations, and to continually hone their craft. However, even many formally trained brewers may not have a good understanding of the cleaning products they use or how to apply them in the most effective manner. Likewise, brewery production staff may not know how to identify potential cleaning issues or understand how cleaning products, procedures, and systems work. These topics are not well covered in many college brewing courses and textbooks. Key components of cleaning products and how they work: Understanding cleaning products will lead to making better selections, resulting not only in improved microbiological performance but also in reduced cleaning time and costs. Brewery cleaning procedures: Knowing fundamental procedures will enable examining and improving existing procedures for efficiency and effectiveness. Brewery cleaning systems: Understanding the equipment and principles associated with typical cleaning systems will allow determining whether current systems are designed and working correctly, as well as improve microbiological performance and reduce cleaning time and costs. Optimizing, auditing, and troubleshooting cleaning systems: Recognizing common issues and knowing how to troubleshoot them will increase productivity and lower costs. Developments in cleaning technologies: Considering technologies such as acid cleaning and sanitizers will provide options for reducing cleaning time and utility costs. Safe handling, storage, and disposal of chemicals: Following best practices will lower the risk of injuries, help compliance with local regulations, and avoid the costs that can be related to both. The author, Richard J. Rench, is an experienced and well-qualified brewer. In addition, he has spent many years working with a chemical cleaning product supplier to resolve cleaning issues in a variety of breweries and to provide solutions that help reduce costs while improving microbiological performance. 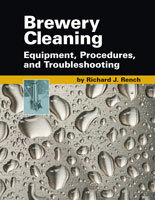 Brewery Cleaning will be an indispensable resource for brewery production professionals, including brewmasters, brewers, and lead hands, as well as brewery engineers and quality control managers and staff. Quality control and assurance managers in the dairy industry will also find this book valuable in addressing cleaning issues. 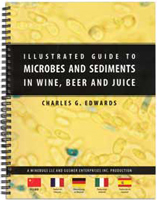 For brewing instructors and their students, this book will provide the text they have needed for some time.